NextEra (commonly referred to as Nexterror) refused to sign the amended contract. When the landowner asked for payment for his legal fees, he was told, “I received your request for compensation related to the payment of legal review of NextEra’s easement offer. In this case, we do not yet have an executed agreement and, as I mentioned, NextEra does not normally pay legal fees for review of unsigned easements.” End of story? Not quite, read on. Whoaaaaa…. that means they promise to pay for all legal advice, whether a lease is signed or not. I guess they didn’t know about our landowner. So, the Intervenor Group made the OEB aware of this situation on June 3, 2013. In this link you can read all the correspondence the landowner kept and submitted to the OEB to prove he hadn’t received payment. In fact, it’s pretty clear that they didn’t want to pay the landowner – and suddenly they quit talking. 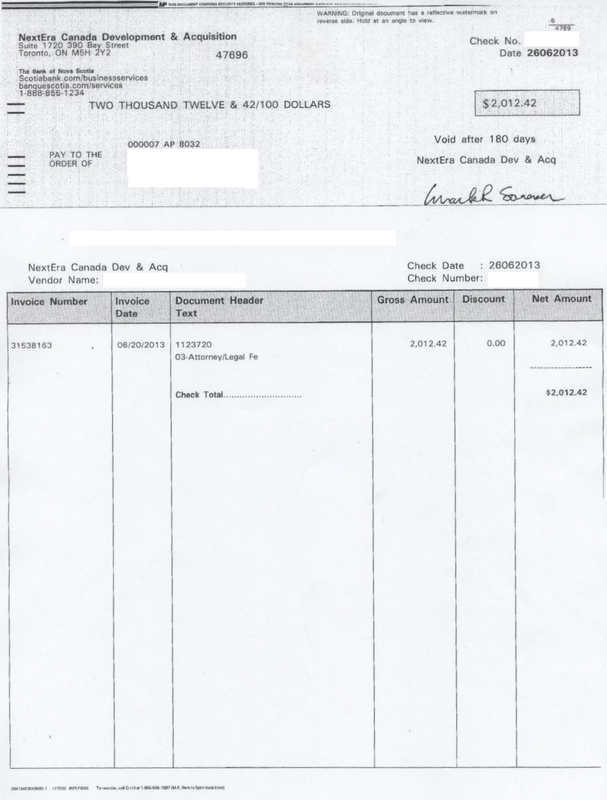 But after this was put on the OEB Public Registry, a cheque for the full amount arrived in the mail – about 4 weeks after that last submission to the OEB. They paid the full amount (without interest). Yes, you too can submit that bill you have in the files. Serve it on them – not only NextEra, ALL the wind companies. And, if they say they won’t pay, send a letter to their legal department or company president and reference the OEB links above. Small as this victory may seem, we have caught a wind company in a lie and made them pay what they promised. NextEra has capitulated and will pay for independent legal advice. Spread the good word. Rural residents deserve to be treated as equals. You can read more about this application here. Posted on August 1, 2013, in Next Era, Take Action. Bookmark the permalink. Leave a comment.